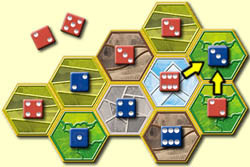 36 Hexagon-shaped land tiles to build your own scenarios. 40 dice at your service! Quick start rules for immediate fun or complex settings for a deep strategy: it's up to you to decide how to play your own game! Object of the game: to gain possession of Diceland, eliminating all adversaries or finishing with the highest score.